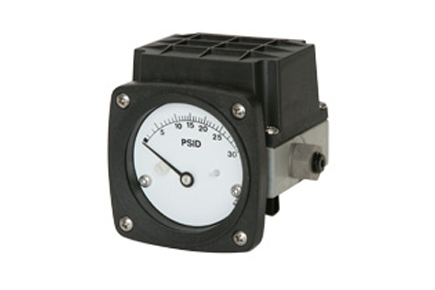 The Mid-West Model 121 piston type gauges are primarily designed for liquid applications. Differential Pressure is sensed by the movement of a precisely ground floating piston/magnet in a precision bore against a calibrated spring. Any variation in pressure on either side of the piston/magnet will cause the magnet to move proportionally to the change in differential pressure. A rotary pointer magnet located close to the internal magnet, but outside the pressure housing, follows the movement of the piston magnet and indicates differential pressure on the dial. Piston type DP gauges exhibit a slight amount of bypass as the fluid crosses from the high to the low pressure port. Material of Construction of Body – Aluminum, 316/316L Stainless Steel.